An accessible resource encompasses information on the ever-expanding fields of science and technology for non-technical readers, furnishing more than 6,500 entries, as well as hundreds of graphics, to encompass facts about the life sciences, mathematics, chemistry, physics, and others. Original. 15,000 first printing. 9780375719622 | Random House Inc, July 1, 2001, cover price $17.95 | About this edition: An accessible resource encompasses information on the ever-expanding fields of science and technology for non-technical readers, furnishing more than 6,500 entries, as well as hundreds of graphics, to encompass facts about the life sciences, mathematics, chemistry, physics, and others. 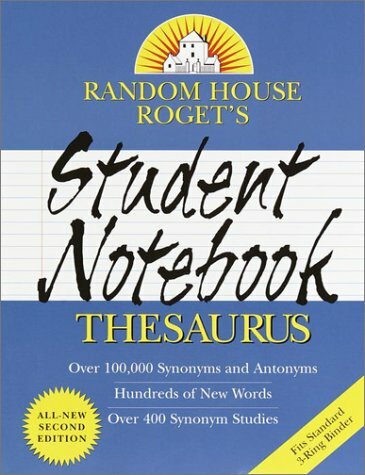 9780375719561, titled "Random House Roget's Student Notebook Thesaurus" | Random House Inc, July 1, 2001, cover price $4.99 | also contains Helen Keller: Collection Novels | About this edition: In an all-new second edition, Random House Roget's Student Notebook Thesaurus includes the most current vocabulary for 2001. 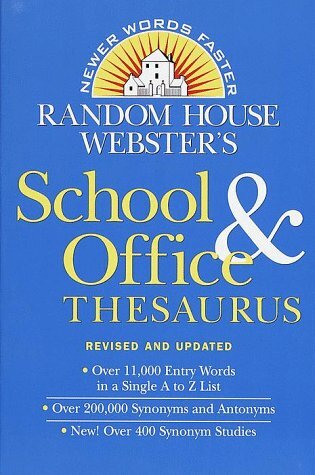 9780375425691 | Random House Reference &, July 1, 2001, cover price $6.99 | About this edition: This compact desktop reference book is based on the "Random House Webster's School and Office Thesaurus," one of the most comprehensive and contemporary word guides today. Newly revised and updated, a handy vocabulary builder and language resource features a single, easy-to-use alphabetical listing of more than twelve thousand main-entry terms with more than 400,000 synonyms and antonyms, along with examples of their use in sentences. 20,000 first printing. 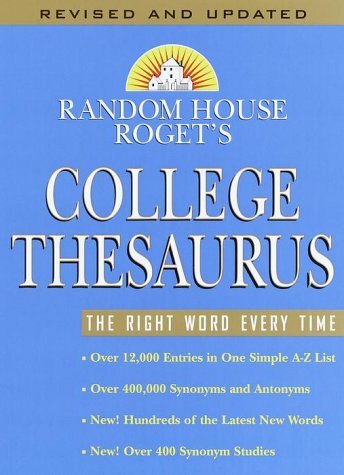 9780375425592 | Rev upd edition (Random House Reference &, October 1, 2000), cover price $20.95 | About this edition: Presents an alphabetically-arranged list of more than 12,000 terms with more than 400,000 synonyms and antonyms, along with examples of their use in sentences. 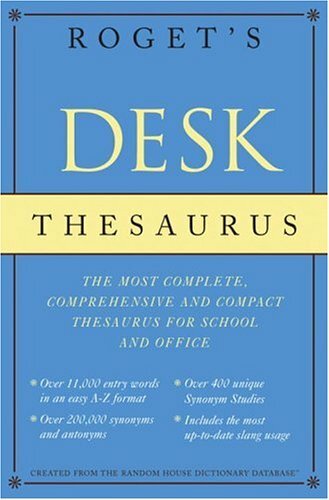 A revised thesaurus contains more than 200,000 synonyms and antonyms for thousands of words, listed in alphabetical order, along with guidance on distinguishing words with similar meanings, and identification of slang terms. Original. 10,000 first printing. A vest-pocket reference provides synonym and antonym lists that encompass more than eighty thousand words and an easily accessed, alphabetical format, and includes parts of speech and usage labels. Original. 50,000 first printing. 9780679764298 | Random House Inc, September 1, 1995, cover price $6.99 | About this edition: A vest-pocket reference provides synonym and antonym lists that encompass more than eighty thousand words and an easily accessed, alphabetical format, and includes parts of speech and usage labels.